Mark’s brushed-finish KVA Stainless winter training bike is finally finished. This was a really fun project and I’m excited because I know Mark is going to ride it a lot. It’s a little different from my usual aesthetic, but I’m quite pleased with the result. It was especially fun to be able to assemble it right away after I finished it instead of shipping it off to be painted or powder coated and waiting for it to return. Gleaming in the spring sunshine! While it doesn’t have provision for a handlebar bag, this bike is certainly going to be ridden in the dark so we decided to use a front and rear light system powered by a Schmidt SON Delux hub. 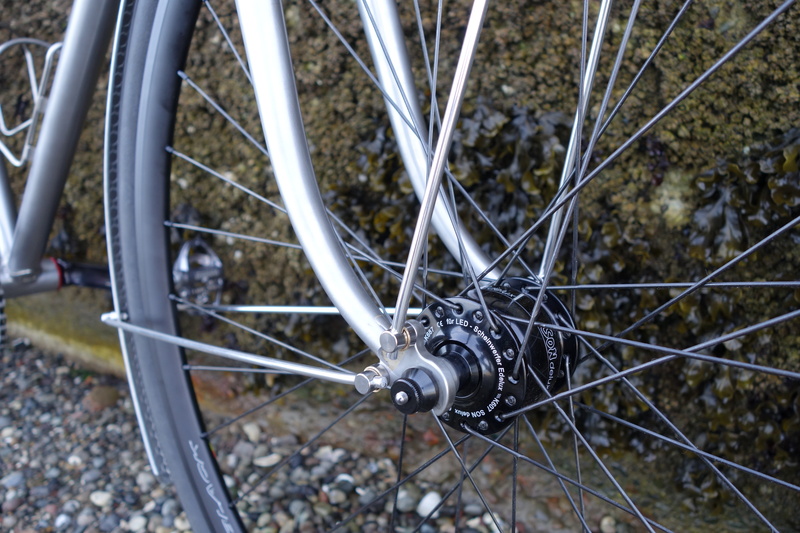 This is the SL version so instead of plugging wires into the hub with spade connectors, a special fork dropout automatically makes contact when the wheel is installed. The extra fender stay will keep the front part of the fender stable even though there is no rack to attach it to. I had a birthday back in January. Miraculously, the weather was wonderful! 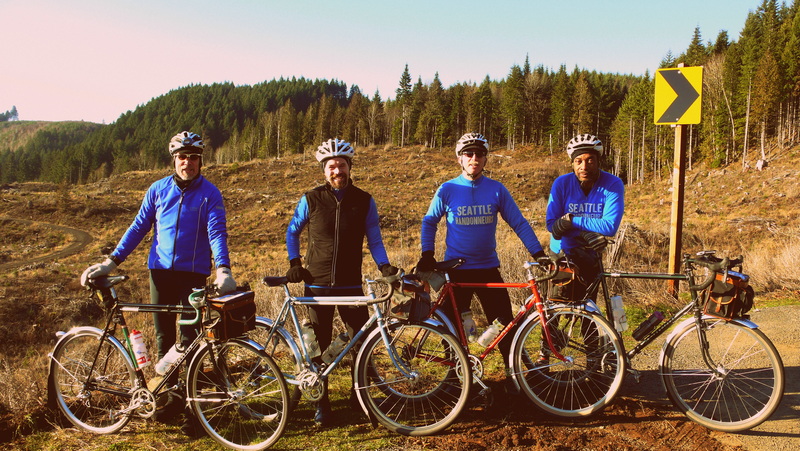 Three customers and friends came out to ride with me making the largest gathering of Thompson bicycles to date. I was very gratified by their attendance, but even more amazing is that with the addition of Theo on his MAP and James on his Weigle modified Raleigh, half of the people on the ride were running 650B wheels and six out of ten were on “proper” randonneuring bikes! If someone had told me ten years ago that such a thing would happen, I would have laughed out loud. We’ve come a long way! Left to right: Alan, me, Andy, and Vinny. 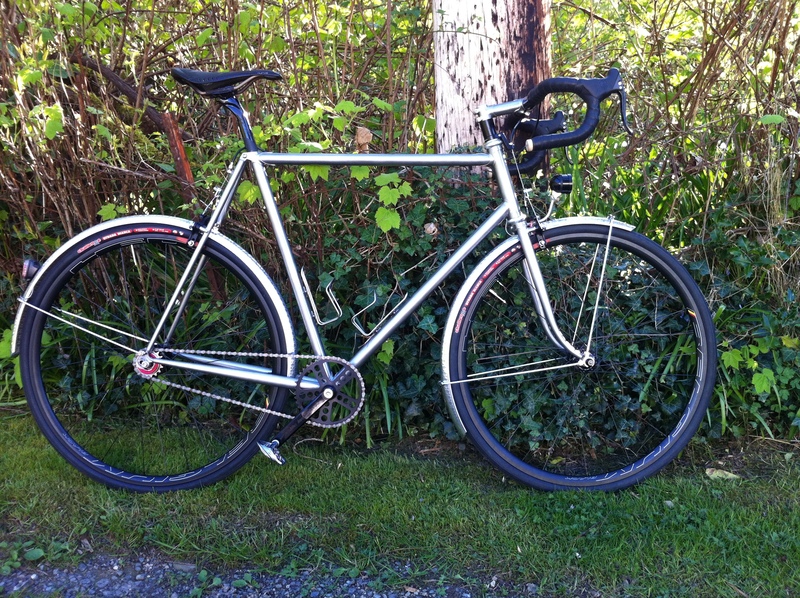 This entry was posted on April 16, 2014 by Thompson Custom Bicycles. It was filed under Uncategorized .